OCTOBER 2018 I PCB007 MAGAZINE 9 tolerances with 3) an any-panel-count capabil- ity, all while operating with 4) less energy, 5) fewer chemicals, and 6) delivering fabricated product in about an hour with 7) a 99.9% ex- pected yield. Those are a LOT of challenging objectives to achieve all at the same time. We'll take you through the plant, talk to the staff, and bring you technical details from each of the leading equipment suppliers who worked as a team with Stepinski to create this step forward in North American fabrica- tion. You'll also meet the new generation of twenty-somethings who are innovating PCB fabrication operations. GreenSource shows us what 21st-century printed circuit fabrication will look like. We lead off this issue with a walking tour of the entire facility. Stepinski and Barry Matties discuss the processes and the equipment. As they do, the conversation always comes back around to planning for the future. 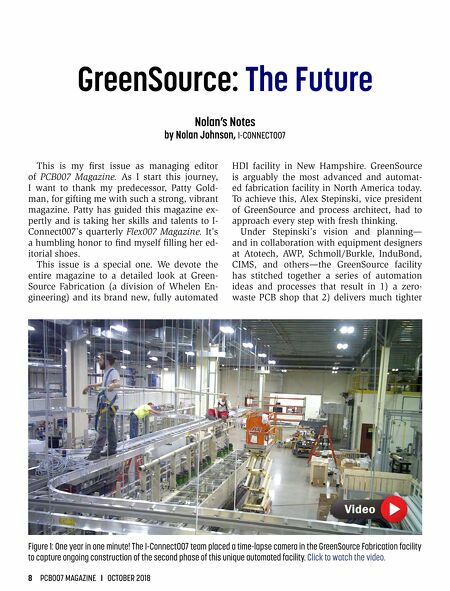 Next, Happy Holden takes us deeper into the modernized methods at GreenSource, and ex- actly how they contribute to "Lean" as well as "green" with an assessment of the manufac- turing efficiencies. Atotech is one of the key equipment suppli- ers we showcase in this issue. The lively, tech- nically rich conversation with the Atotech sup- port team dives into all the Atotech processes, environmental innovations, and chemistry on- line at GreenSource. Drills and laser processing equipment play a vital role at GreenSource. In our next article, Patty Goldman explores all the Schmoll and Burkle equipment with Burkle's David How- ard. If you've only ever thought of drills as a mechanical fabrication step, you need to read this interview. The staff play a critical part in the operation of any manufacturing facility. I gathered all the employee interviews we conducted on site and spotted some common themes and objec- tives that GreenSource is employing to build a world-class, sustainable staff. Next, we track back to the equipment with an exposé on InduBond and their innovative lamination technology. InduBond's use of elec- trical induction to laminate multilayers pro- vides significant cost savings and efficiency, making this conversation between Víctor Láza- ro and the I-Connect007 editorial team a must- read. 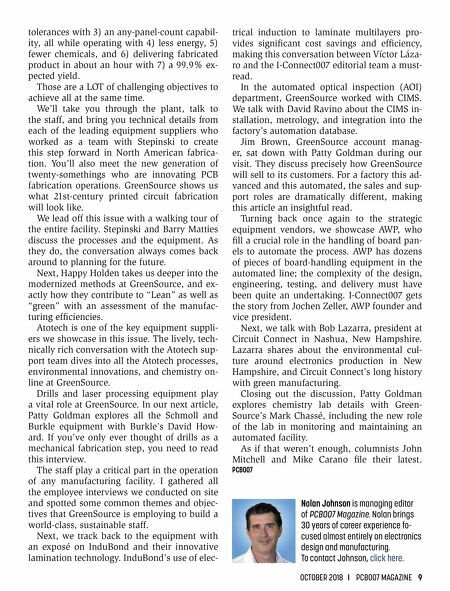 In the automated optical inspection (AOI) department, GreenSource worked with CIMS. We talk with David Ravino about the CIMS in- stallation, metrology, and integration into the factory's automation database. Jim Brown, GreenSource account manag- er, sat down with Patty Goldman during our visit. They discuss precisely how GreenSource will sell to its customers. For a factory this ad- vanced and this automated, the sales and sup- port roles are dramatically different, making this article an insightful read. Turning back once again to the strategic equipment vendors, we showcase AWP, who fill a crucial role in the handling of board pan- els to automate the process. AWP has dozens of pieces of board-handling equipment in the automated line; the complexity of the design, engineering, testing, and delivery must have been quite an undertaking. I-Connect007 gets the story from Jochen Zeller, AWP founder and vice president. Next, we talk with Bob Lazarra, president at Circuit Connect in Nashua, New Hampshire. Lazarra shares about the environmental cul- ture around electronics production in New Hampshire, and Circuit Connect's long history with green manufacturing. Closing out the discussion, Patty Goldman explores chemistry lab details with Green- Source's Mark Chassé, including the new role of the lab in monitoring and maintaining an automated facility. As if that weren't enough, columnists John Mitchell and Mike Carano file their latest. PCB007 Nolan Johnson is managing editor of PCB007 Magazine. Nolan brings 30 years of career experience fo- cused almost entirely on electronics design and manufacturing. To contact Johnson, click here. Feature Interview — Atotech Brings World-Class AHDI to the U.S.